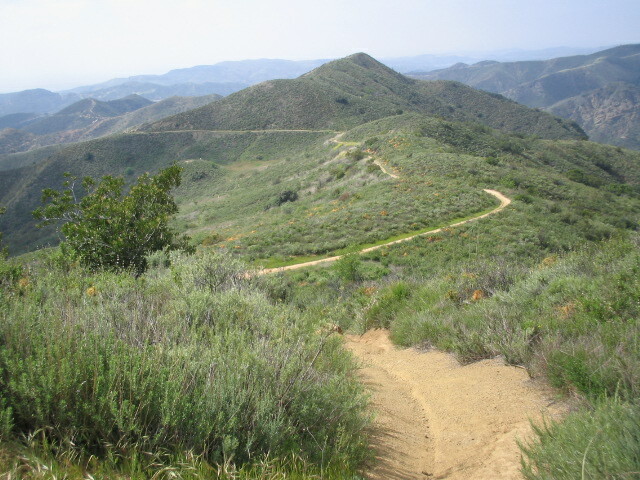 Very popular loop Trail! Park just to the right of Cook's corner and start to ride up Santiago road which leads to the brief climb up Majeska grade. 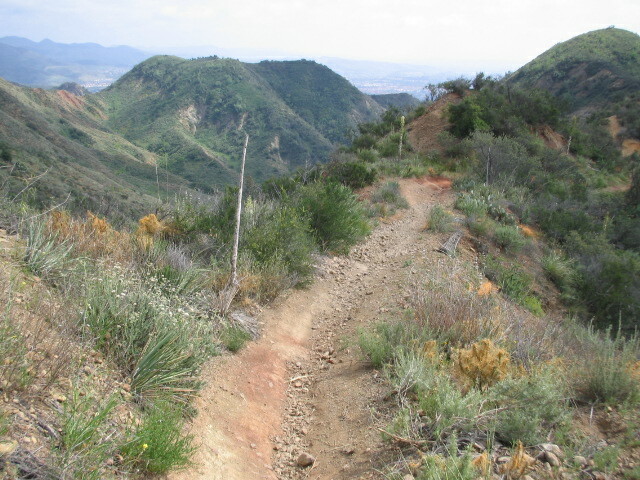 The 3.5 miles on Santiago Truck doubletrack trail begins at the top of 'the grade'. 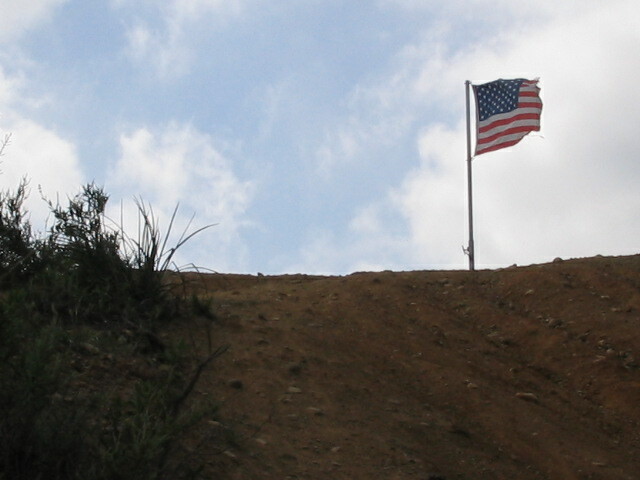 The Luge singletrack descent begins when you veer right after the flag. The final mile of the ride is a highspeed downhill dash back to Cook's Corner. Post your activity, just type in a few details. Post your activity from a GPX file. Get a gpx file of your activity from Garmin Connect or from Strava. For example, upload your activity from your GPS to Strava then save as GPX to your computer. 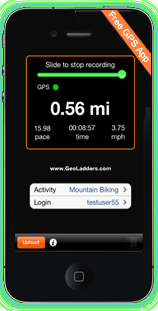 Click this Upload GPX button to then upload it to GeoLadders. Steps to create GPX from Strava: Open the activity in Strava, click the 'Action' icon on left (wrench), select 'Download GPX' (saves to 'Downloads' on your computer). 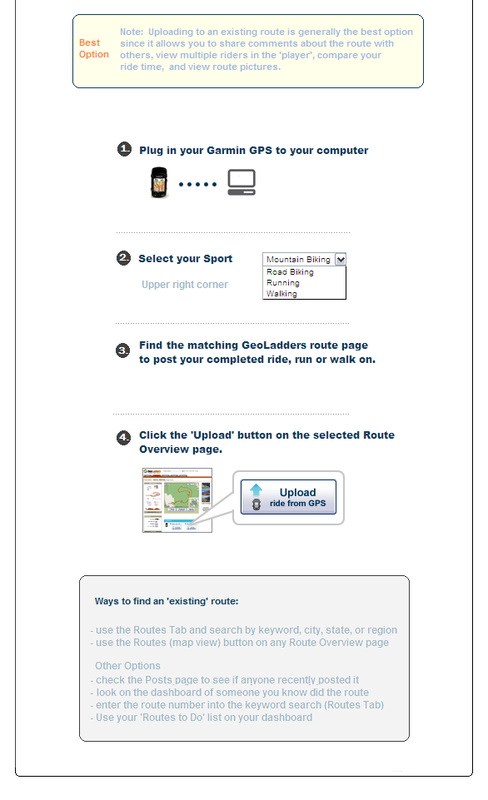 Go to www.geoladders.com, open the existing route you want to post to, select 'Post GPX to this route' (on left), then click the 'Browse' button (middle of page), find the GPX in your 'Downloads' directory. Double click, save. That's it. Your route appears on geoladders.com/posts and in your dashboard. Copy this GeoLadders route to your computer. To get the downloaded gpx file from your computer onto your GARMIN device, login to Garmin Connect at connect.garmin.com. STEP 1). Select ACTIVITIES (far left menu, 5th option) STEP 2). Upper right, click IMPORT, then click BROWSE, middle of page. STEP 3). Double click the activity, then click IMPORT DATA button. STEP 4). The activity opens (in Garmin Connect), then upper right, of the 5 icons, click the GEAR icon 5. then SEND TO DEVICE (Note: you can rename the acivity before sending to your device). The activity will show in 'Courses' on your Garmin device with the default name or the name you gave it. 6. You'll need to unplug your device to view courses on your device. That's it. After work ride with Troy - trying to stay ahead of the G-2 riders. Good ride w Troy after work last night. What a muddy mess. STT was in pretty good shape for the most part, but the Luge is one big muddy mess from the top on. It was nothing more than sliding down though mud and ruts. We saw so many people heading up the day prior, so we thought it might be a go. Really, it needs about a week after the rain stops to dry out. Not worth it for now. Should have brought an inflatable raft to canoe down the Luge. Been a while since doing a night ride after work. A few other riders out there and cloudy up on STT. Maybe 20 feet of visibility.